About a month or so ago, my uncle passed away unexpected due to a heartattack. My grandfather is very sick with Alzheimer's and resides in a nursing home. For the holidays, we surprised the family and hired an ambulate to bring him over. 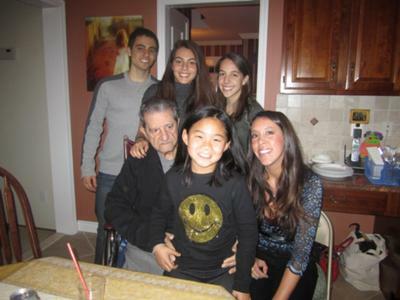 Myself, and his four other grandchildren took a picture with him. 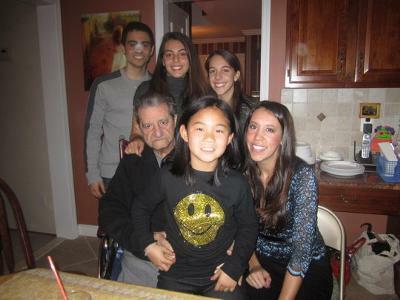 My cousin took the picture for us (picture 1), and told us to take one more, that Johnny blinked. In the attached pictures, I've included both copies of the photo. There is something on Johnny's nose in the first picture. If you look parallel to Johnny, over my head (I am in the black and blue shirt) and by the cabinet there is another white circle. Originally I was standing, had I not sat down, the circle would be on my nose too. In the second picture (picture 2), both are gone. Keep in mind picture #2 was taken within seconds of picture #1. No one was moving, there were no reflections of light or jewelry. 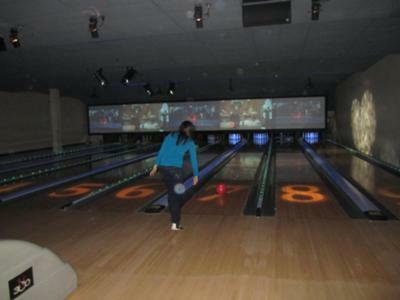 The following day, everyone went bowling as a family get together. In the third picture (picture 3) is Melissa bowling. Melissa was my uncle's "favorite" niece. Is there any way you think that this can be him hanging on to make sure he's seen everyone before fully departing?